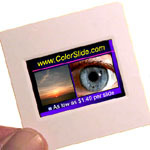 Your digital images are printed to a film recorder to produce 35mm color slides in 10 to 14 days on average. Your shipping choice will add on additional days. You can speed it up by adding on Priority RUSH Service. This is step 1 and uploading your files is step 2. Please Note: For 23 years we've always been able to have our 35mm color slide film processed locally and today (Mar. 15, 2017) is the end of that. The local lab's processing machine broke. Every other local film processing lab closed years ago, so now we will ship your film to the best lab in the USA and they will ship it back. Finally we'll ship the finished 35mm color slides to you. This back and forth takes time and it's not a daily thing, so the turnaround time cannot be guaranteed anymore. Small orders will have to wait for the roll of film to be filled because small orders can't cover the cost of the 35mm color slide film and film processing.